Several sources list Philip S. Markley with 2030 votes, including the The Union. United States Gazette and True American (Philadelphia, PA), The American Sentinel (Philadelphia, PA), the Lancaster Journal (Lancaster, PA), and the Correspondent and Farmers' Advertiser (Doylestown, PA). Several sources list Philip S. Markley with 2012 votes and John Hughes with 1888 votes, including The Oracle of Dauphin (Harrisburg, PA), the Chronicle of the Times, and Berks and Schuylkill Advertiser (Reading, PA), the Penssylvania Intelligencer and the Bellefonte Patriot (Bellefonte, PA). The Spirit of Pennsylvania (Easton, PA) lists Philip S. Markley with 2039 votes. 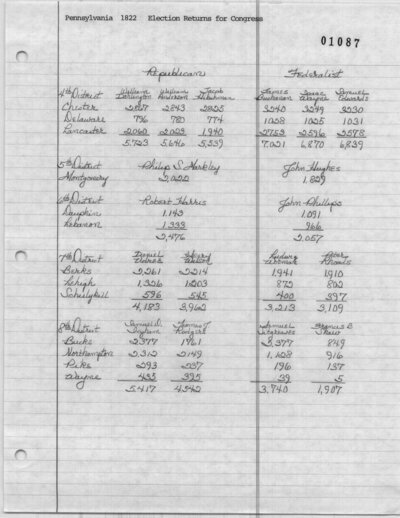 The History of Montgomery County, by Theodore W. Bean, lists Philip S. Markley with 2056 votes. The Norristown Herald and Weekly Advertiser (Norristown, PA) reports 2005 votes for Philip S. Markley and 1846 votes for John Hughes. The Norristown Herald and Weekly Advertiser (Norristown, PA) reports 110 votes for Philip S. Markley and 127 votes for John Hughes. The Union. United States Gazette and True American (Philadelphia, PA) reports 435 votes for Philip S. Markley and 466 votes for John Hughes. The Union. United States Gazette and True American (Philadelphia, PA). October 11, 1822. Norristown Herald and Weekly Advertiser (Norristown, PA). October 16, 1822. Chronicle of the Times, and Berks and Schuylkill Advertiser (Reading, PA). October 17, 1822. Lancaster Journal (Lancaster, PA). October 18, 1822. Pennsylvania Intelligencer (Harrisburg, PA). October 18, 1822. Poulson's American Daily Advertiser (Philadelphia, PA). October 18, 1822. The Union. United States Gazette and True American (Philadelphia, PA). October 18, 1822. American Sentinel and Mercantile Advertiser (Philadelphia, PA). October 19, 1822. Franklin Gazette (Philadelphia, PA). October 19, 1822. Correspondent and Farmers' Advertiser (Doylestown, PA). October 22, 1822. Bellefonte Patriot (Bellefonte, PA). October 23, 1822. Spirit of Pennsylvania (Easton, PA). October 25, 1822. Lancaster Intelligencer (Lancaster, PA). October 26, 1822. The Oracle of Dauphin (Harrisburg, PA). October, 1822. Bean, Theodore W., ed. History of Montgomery County. Philadelphia: Everts and Peck, 1884. 526.